Living a Fit and Full Life: Get Ready for Halloween with RM Palmer's Delicious Halloween Candy! Get Ready for Halloween with RM Palmer's Delicious Halloween Candy! Treat the entire neighborhood this year with the seasonal flavors of caramel apple and pumpkin spice inside a rich chocolaty shell. This assortment wrapped in fun, twisted foil wrappers is available in 12 ounce and 20 ounce bags. This NEW 44 ounce stand up bag contains an assortment of pouched candy including Fudge Skulls, decorated Pumpkin Peanut Butter Cups, Double Crisp® Witches and NEW Cookies & Crème Zombies. Get $1 off this size with on pack coupon. Something for all the neighborhood trick-or-treaters. Keep an eye out for Palmer’s Creepy Peepers Mix this Halloween. This bag is available in a 20 or a 38 ounce bag and features a mix of bite sized chocolaty coated Peepers with a creamy soft caramel center, or peanut butter or fudge filling. 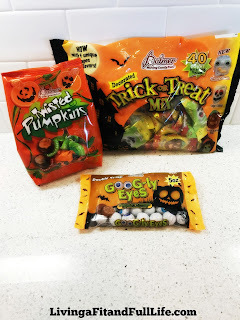 Get ready for Halloween with RM Palmer's delicious Halloween candy! RM Palmer has a terrific selection of Halloween candy and I have to say it's all quite delicious! 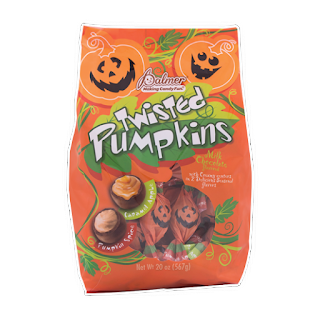 RM Palmer's Twisted Pumpkins have caramel apple and pumpkin spice filling inside a rich chocolaty shell. It's the perfect way to enjoy the flavors of fall! 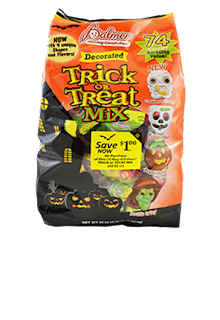 RM Palmer's Trick or Treat Mix with NEW Cookies & Creme Zombies are extremely festive and delicious! They're perfect for passing out this Halloween! 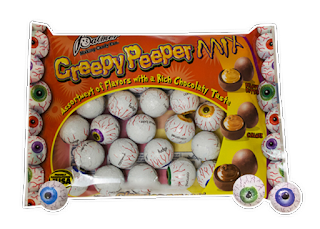 RM Palmer's Creepy Peepers Mix and Goog-ly Eyes make the perfect treats any time of day. I love that they're small and I can eat a few without feeling guilty. They're also perfect for adding to candy dishes at home or around the office. RM Palmer's delicious Halloween Candy is sure to please so be sure to stock up!